PHILADELPHIA–(BUSINESS WIRE)–Are you ready for some football? Aramark (NYSE: ARMK), the food service provider that partners with more NFL teams, and serves more football fans than any other hospitality company, is! To prepare for the upcoming season, where they will serve more than six million football fans, Aramark’s culinary and innovation teams explored local food trends and dove into fan feedback and consumer insights, to create unique menu items reflecting each city’s local flavors and signature tastes. The only thing better than one taco is three! 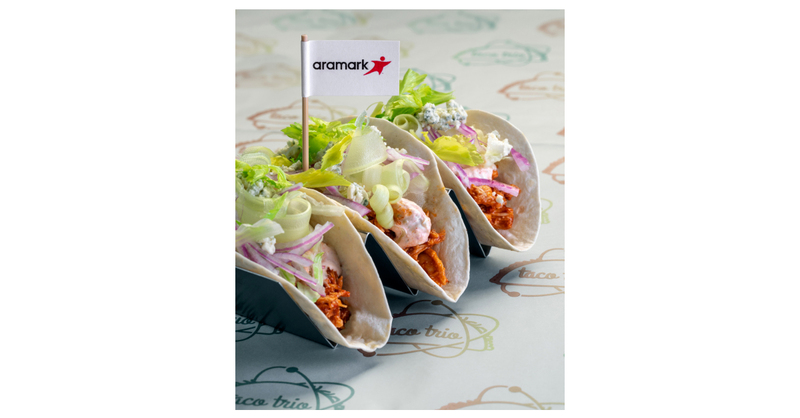 This season, Aramark will serve signature taco trios, influenced by the hometown team, city or its fans. Battle Red Tacos (NRG Stadium) – Flamin’ Hot Cheetos-crusted chicken tenders, mango pico de gallo, Sriracha mayonnaise, flour tortilla. Bay Spice Brisket Tacos (Raymond James Stadium) – Spice-crusted brisket, queso fresco, radish, cilantro crema, jalapeno slaw, flour tortilla. Buffalo Chicken Tacos (Heinz Field) – Buffalo chicken, spicy blue cheese sauce, shredded lettuce, shaved celery, red onion, flour tortilla. Chesapeake Tacos (M&T Bank Stadium) – Old Bay pulled chicken, Maryland crab dip, corn salsa, cheddar jack cheese, purple corn tortilla. Chipotle Chicken Tacos (U.S. Bank Stadium) – Chipotle chicken, coleslaw, lime sauce, flour tortilla. Elote Chicken Tacos (Arrowhead Stadium) – Hatch chile-braised chicken, roasted corn pico de gallo, Cotija cheese, corn cake. Mojo Pork Tacos (Lincoln Financial Field) – Mojo-style chopped pork, queso blanco cheese sauce, pickled diced red onions, cilantro, long hot pepper hot sauce, fried flour tortillas. Pork Belly Tacos (Soldier Field) – Bulgogi (Korean-style grilled meat) marinated braised pork belly, daikon and carrot Asian-style slaw, grilled scallions, Sriracha pepper sauce, flour tortilla. Roasted Pork Tacos (Paul Brown Stadium) – Roasted pork, salsa verde, roasted street corn, BBQ chips, flour tortilla. Smokehouse Chicken Tacos (FirstEnergy Stadium) – Hickory-smoked coriander chicken, chili-spiked pepper jack queso, Ohio sweet corn pico de gallo, habanero cilantro crema, flour tortilla. Cubano (U.S. Bank Stadium) – House cured and roasted pork Cubano with shaved ham, Swiss, house garlic, pickles, mustard, local Cuban roll. Kielbasa Cheesesteak (M&T Bank Stadium) – Sliced Dietz and Watson kielbasa, mixed with peppers, onions and sauerkraut, American cheese, hoagie roll. Kingdom Inferno Chicken Sandwich (Arrowhead Stadium) – Hand-breaded chicken tenders, Carolina reaper pepper mayo, pepper jack cheese, sliced jalapenos, Buffalo sauce, brioche bun. Market Bar-B-Que Smoked Brisket (U.S. Bank Stadium) – House smoked brisket, classic sauce, caramelized onions, coleslaw, garlic butter toasted bun, with kettle chips on the side. Pimento Cheese Melt (Raymond James Stadium) – Pimento cheese and thick Applewood bacon, Texas toast. Texas Smoked Meatball Sub (NRG Stadium) – Hickory smoked meatballs on a sub roll. Beef Rib (NRG Stadium) – House-smoked large beef rib. Chicago Hot Chicken Fries (Soldier Field) – Seasoned popcorn chicken, beer cheese, signature hot sauce, crumbled blue cheese, carrot-celery slaw, cool ranch drizzle. Franco Harris Pizzeria “Pro Bowler” (Heinz Field) – Artisan dough, whole milk mozzarella, San Marzano tomato sauce, Parma pepperoni, fresh basil, extra virgin olive oil. Jamaican Jerk Sausage (Arrowhead Stadium) – Jerk pork sausage, habanero mango slaw, crispy plantains, toasted New England bun. North Shore Huluski (Heinz Field) – Potato cheese pierogis, kielbasa, braised cabbage. Tennessee Hot Chicken Mac & Cheese (Arrowhead Stadium) – Classic mac & cheese, Tennessee hot popcorn chicken, hot sauce simmered onions. Teriyaki Beef Tater Tots (Paul Brown Stadium) – Tater tots, teriyaki marinated skirt steak, Asian slaw, Sriracha BBQ sauce. Traditional Sonoran Hot Dog (Paul Brown Stadium) – Bacon wrapped all-beef black angus foot long hot dog, pinto beans, white onions, tomatoes, fresh jalapenos, mustard, mayonnaise, salsa verde, queso fresco, traditional Bollilo roll. As part of Aramark’s Healthy for Life 20 By 20 initiative, and ongoing commitment to providing fans with greater variety, choice and access to healthier menu options, Aramark continues to expand vegan and vegetarian options in the stadiums it serves. Beyond Burger (Arrowhead Stadium) – Vegan burger, arugula, tomato, red onion, toasted bun. Grilled Veggies and Hummus Flat Bread (Paul Brown Stadium) – Fresh, grilled seasonal veggies, hummus spread, cauliflower crust. Vegan Sausage (Arrowhead Stadium) – Cauliflower/walnut/wild rice sausage in vegan casing, maple walnut tapenade, cran-apple slaw, toasted New England bun. Aramark partners with premier restaurateurs and top local and celebrity chefs, including several James Beard Award winning chefs, who will be introducing new offerings at stadiums this season. Among Aramark’s culinary partners at NFL stadiums are Andrew Zimmern, Chris Shepherd, David Chang, David Morton, Gavin Kaysen, Jimmy Bannos Jr., Jonathon Sawyer, Michael Symon, Rocco Whalen, Ronnie Killen and other celebrity chefs from across the country. B-Spot Red Zone Bratwurst (Michael Symon, FirstEnergy Stadium) – Beer bratwurst, caraway Cleveland kraut, spicy mustard and Tony Paco’s pickles. Fuku Spicy Fried Chicken Sandwich (David Chang, Lincoln Financial Field) – Habanero brined thigh served on a Martin’s potato roll and garnished with pickles and butter. Fuku Fingers and Fries (David Chang, Lincoln Financial Field) – Crispy chicken breast paired with sweet jalapeño-seasoned fries; choice of house made honey mustard or ranch. Georgia James Carved Roast Beef Sandwich with Wedge Slaw (Chris Shepherd, NRG Stadium) – 44 Farms beef, horseradish cream, pickled red onions, blue cheese, bacon, onion, tomatoes. Aramark is on the forefront of stadium innovation, with the launch of the following concepts, which are all the first of their kind in an NFL stadium. Tour de Taps – Aramark’s new fleet of Beer Cycles — three-wheeled, mobile and interactive beer bikes — will offer an additional location for fans to purchase beer. The carts will serve two varieties of draft beer, are designed with the local team’s colors and will be stationed in general concessions areas in each NFL stadium Aramark serves. Compostable Peanut Bag – Aramark is committed to stopping waste before it is created and debuted the first-ever pre-packed compostable peanut bag at a professional sports venue last season. The compostable peanut bag was recognized and awarded Green Sport Alliance’s Innovator of the Year award, and will be available at Arrowhead Stadium and U.S Bank Stadium this football season. Aramark partners with 14 National Football League teams to provide food and beverage, retail and/or facilities services – Baltimore Ravens, Chicago Bears, Cincinnati Bengals, Cleveland Browns, Denver Broncos, Houston Texans, Kansas City Chiefs, Minnesota Vikings, New York Giants, New York Jets, Philadelphia Eagles, Pittsburgh Steelers, Seattle Seahawks and Tampa Bay Buccaneers. Photos of Aramark’s new NFL menu items can be downloaded here. Aramark (NYSE: ARMK) proudly serves Fortune 500 companies, world champion sports teams, state-of-the-art healthcare providers, the world’s leading educational institutions, iconic destinations and cultural attractions, and numerous municipalities in 19 countries around the world. Our 270,000 team members deliver experiences that enrich and nourish millions of lives every day through innovative services in food, facilities management and uniforms. We operate our business with social responsibility, focusing on initiatives that support our diverse workforce, advance consumer health and wellness, protect our environment, and strengthen our communities. Aramark is recognized as one of the World’s Most Admired Companies by FORTUNE, as well as an employer of choice by the Human Rights Campaign and DiversityInc. Learn more at http://www.aramark.com/ or connect with us on Facebook and Twitter.